New Philadelphia was founded in 1804 by John Knisely. Little is known of his early life, except for the fact that he was born September 21, 1752, and in 1795 moved to Bedford County, PA. Here he owned and operated a grist mill and hostelry and became quite prosperous. John Knisely happened to choose the site of New Philadelphia as a result of his fondness for hunting. In the autumn of 1803, he with his son Samuel, went on a deer hunting trip into the Ohio Country. Crossing the Ohio River, just above where Steubenville is now located, they followed an Indian trail to the Moravian Mission Village of Schoenbrunn, which had been established in 1772 by David Zeisberger. John Knisely and his son, stayed at Schoenbrunn for a few days, and were very successful in hunting deer. John Knisely and David Zeisberger became good friends at this time, and this friendship lasted until Zeisberger's death in 1818. John Knisely was greatly impressed by the natural resources, the beautiful plains, the fertile river bottomlands, and the fine stand of oak timber in the Tuscarawas River Valley. He also noticed that a big plateau in the bend of the river, with numerous smaller valleys centering there, would make a beautiful site for a town and perhaps, as he hoped, a great city. According to Zeisberger's Diary, the son, Samuel Knisely, remained at the Schoenbrunn Mission during the winter of 1803-1804, while John Knisely returned home to Bedford County to begin his project to found his city. On his return home, John Knisely sold his possessions for $16,000.00 and made preparations to move his family, consisting of his wife, six sons and four daughters. Early in the spring of 1804, he started on the trip west with several teams, loaded with articles that would be most needed, such as farm implements, seeds to start their first crops, and other necessary household items. John Knisely also persuaded 33 pioneers to accompany him. They formed the nucleus of the new town. In 1804, Ohio was almost a complete wilderness, with the exception of Marietta, Cincinnati, the Moravian Missions and a few other small clearings in Eastern Ohio. On October 23, 1804, John Knisely met John Heckewelder at Gnadenhutten. Mr. Heckewelder, in addition to his missionary work, acted as agent for land proprietors in the East. In his capacity as land agent, he held the power of attorney for Godfrey Haga, a Philadelphia merchant who owned thousands of acres in this area. Under this power, John Heckewelder sold John Knisely a plot of 3,554 acres for the sum of $5,454.33 which embraces most of the present city of New Philadelphia, Ohio. 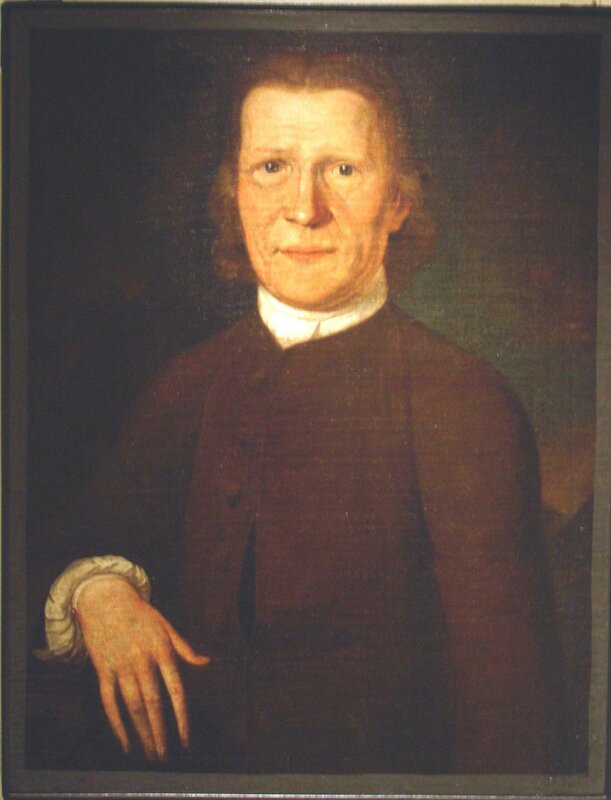 John Knisely, as a result of his meeting with both David Zeisberger and John Heckewelder, became a firm friend of the Moravian Missions. Zeisberger reveals in his diary, that during the War of 1812, the feelings of the early settlers were very much aroused against the Indians, including the Christian Indians. John Knisely stood by the missionaries and prevented any mob action that threatened the missions. He remained a loyal friend of the mission until 1818, when Zeisberger died and the last Moravian Mission Station at Goshen was abandoned. John Knisely was very optimistic, and seemed to feel that New Philadelphia would one day become a great city. Instead of permitting the town to grow haphazardly, as did so many pioneer communities, he planned this site with great care. He employed a surveyor, John Wells, and had him lay out the entire town on a checkerboard plan, similar to the city of Philadelphia, Pennsylvania. In fact, many of the streets were named after the streets of Philadelphia, Pennsylvania. He had three public squares laid out. The present public square, a smaller square, or upper market square, called Franklin Square, which is the present junction of West High Avenue and Fourth Street. A lower market square called Washington Square, still exists at the junction of East High and Beaver Avenues. When the first party of settlers came to New Philadelphia, they stopped to rest at the home of John Knisely. The next day, he escorted them to the site of the town. Reaching the forks of the trail, the present juncture of Beaver Avenue and East High Avenue, he said: "You are now in the town, this is the Lower Market Square, and this (pointing Westward) is High Street!" Looking around, the newcomers could see no town, nothing but bushes and trees. The houses were yet to be built. From this square, they followed Mr. Knisely west on High Street, where the enthusiastic proprietor pointed out the Courthouse Square, where he stated the Court House and Public Buildings would be erected. This square was like the former, with the exception that some bushes were cut and some corner stakes driven. John Knisely showed his greatest public spirit in his influence and generous gifts to the community. It was largely through his activity and conditions that New Philadelphia was selected as the County Seat, when Tuscarawas County was established in 1807. The city of Dover, founded shortly after New Philadelphia, strongly contested for the seat of Government, but John Knisely, by calling attention to the fact his town was the first white man's settlement in the County, and by offering to give and for the public buildings, secured this honor over Dover. He not only gave the site of the Court House, but also donated 100 lots, and 160 outlying acres, to be sold by the County Government, the proceeds to be used in defraying the expense of constructing the Court House and Public Buildings. John Knisely also took an active interest and participated in religion and education. He donated four lots to each of the following societies: the English Religious Society, the German Religious Society and the Moravian Religious Society. In his honor, the old Central School was designated as the John Knisely School. However, when the new school was built, his name was dropped. 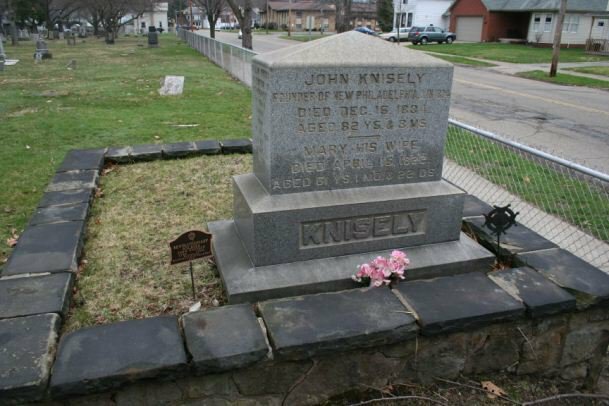 John Knisely died on December 15, 1834 at the age of 84 years. His burial plot is located in the East Fair Street Cemetery, another of his donations to the city of New Philadelphia, where his tombstone states simply, what he undoubtedly would consider the greatest honor, "JOHN KNISELY, Founder of New Philadelphia".